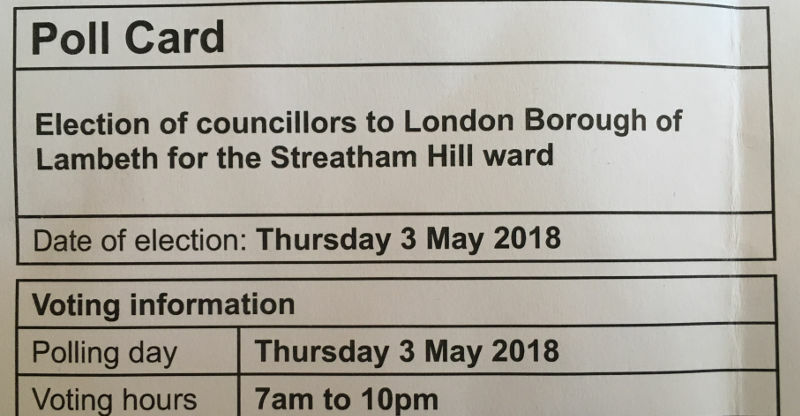 On Thursday the 3rd of May 2018 there will be elections for local councils in London. To help you decide who to vote for we have summarised the candidates for each of Streatham’s four councils. Let us know who you will be voting for and why you are voting for them in the comments section below! Streatham has four councils: Streatham Hill, St Leonard’s, Streatham Wells and Streatham South. Your poll card will tell you which ward you live in. It will also tell you where your polling station is. 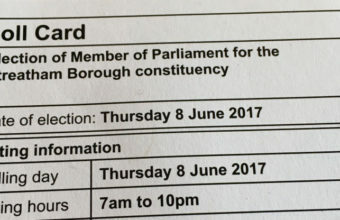 Three councilors are to be elected for the Streatham Hill ward. The Labour candidates are the currently elected councilors. The Labour candidates are Liz Atkins, Rezina Chowdhury and Ian Simpson. Liz lives on Palace Road. Rezina lives on Wavertree Road and Ian lives on Rushcroft Road. The Conservative Party candidates are Alexa Bailey, Simon Hemsley and Kushal Patel. Alexa lives on Mount Ephraim Road, Simon lives on Drewstead Road and Kushal lives on Wavertree Road (a few doors down from the Labour candidate!). The Liberal Democrat candidates are Ishbel Brown, Roger Giess and Ashley Lumsden. Ishbel lives in Stockwell, Roger and Ashley live together on Wavertree Road. Three councilors are to be elected for the St Leonard’s ward. The currently elected councilors are Robert Hill (Labour), Scott Ainslie (Green Party) and Saleha-Begum Jaffer (Labour). This year the Labour candidates are Stephen Donnelly, Robert Hill and Saleha Jaffer. Stephen lives on Lewin Road, Robert lives on Conyers Road and Saleha lives on Challice Way. The Green Party candidates are Scott Ainslie, Jonathan Bartley and Nicole Griffiths. Scott lives on Leigham Avenue, Jonathan lives on Tooting Bec Gardens and Nicole lives on Drewstead Road. The Liberal Democrat candidates are Jennifer Keen, Fiona Mackenzie and Richard Malins. None of the Liberal Democrat candidates live in Streatham. Jennifer lives in Herne Hill, Fiona and Richard live in Kennington. The Conservative Party candidates are Wendy Newall, Neil Salt and Scott Simmonds. Wendy lives on Hoadly Road, Neil lives in West Norwood and Scott lives on Streatham High Road. 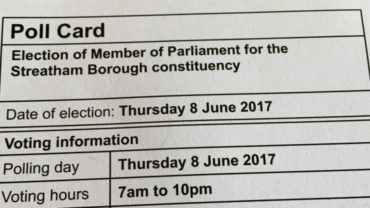 Three councilors are to be elected for the Streatham Wells ward. The current councilors represent the Labour Party. The Labour and Cooperative parties have an alliance in Streatham Wells. The Labour and Cooperative candidates are Malcolm Clark, Marianna Masters and Mohammed Seedat. Malcolm lives on Leigham Close, Marianna lives on Brixton Hill and Mohammed lives in West Norwood. The Green Party candidates are Rebecca Deegan, Clifford Fleming and Sheila Freman. Rebecca lives on Leigham Avenue, Clifford lives on Riggindale Road and Sheila lives on Sunnyhill Road. The Conservative Party candidates are Russell Henman, Lisabeth Liell and Teresa Tunstall. Russell lives on Riggindale Road, Lisabeth lives on Valley Road and Teresa lives near Streatham Common. The Liberal Democrat candidates are Eloka Ikegbunam, Dominic Leigh and Helen Thompson. Eloka lives on Braeside Road, Dominic lives on Hopton Road and Helen lives in Tulse Hill. Three councilors are to be elected. All elected councilors are currently from the Labour Party. The Labour Party candidates are Danny Adilypour, John Kazantzis and Clair Wilcox. Danny lives on Lewin Road, John lives on Mount Ephraim Lane and Clair lives on Deerhurst Road. The Green Party candidates are Pete Johnson, Charmian Kenner and David Robinson. Pete lives on Rydal Road, Charmian lives on Sulina Road and David lives on Baldry Gardens. The Conservative Party candidates are Russell Newall, Christopher Paling and Helen Smith. Russell lives on Hoadly Road, Christopher lives in Tulse Hill and Helen lives on Kempshott Road. The Liberal Democrat candidates are Matthew Bryat, Simon Drage, and David Hare. Matthew lives on Goodman Crescent, Simon lives on Hopton Road and David lives in Herne Hill. The UK Independence Party candidates are Simon Harman, John Plume and Johan Ward. Simon lives on Norfolk House Road, John lives on Gracefield Gardens and Johan lives on Branksome Road.